So just how much do I like this little spot? 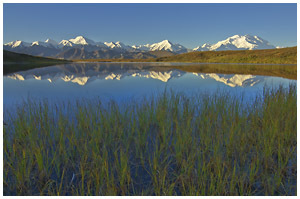 Well, in 2007 I took my mum and dad to Denali National Park and Preserve on their trip to Alaska and force-marched them up over the hills and across the tundra to this pond one afternoon. It’s a pretty spot to sit on the tundra, have some lunch, look for wildlife (we saw caribou) and soak up the mountain’s grandeur. They had a grand time. The trip I took this particular photo on was one of the most productive I’ve had. In the past I’d spent countless hours trekking around the park, though never managed to really catch great light on the mountain. Previously I’d always been in completely the wrong place; like the time I was leaving the park, stopped towards the entrance and turned near the Savage River overlook to see the mountain appearing as though it were lit from inside, seemingly aglow with a fiery light that held me spellbound. But from that distance, photos weren’t really an option. I just stood and enjoyed the scene unfolding in front of me, wondering why I hadn’t planned for a 15 day hike instead of a 14 day trip – one night earlier I had been camped right by the small kettle pond you see in this photo, with a fog so thick I couldn’t even see the other side of the pond. C’est la life. I always consider a view of Denali a treat, even from a distance. Just a few days ago here in Anchorage the weather was clear enough that the mountain was out and I got excited. I still wonder if that’s something that I’ll ever become blasé about. I certainly hope not. I posted this image today because I’m working on some older files, photo editing, cleaning up hard drives and so forth, and figured this photo could use a little touch up in processing. It’s always been a favorite of mine, but I was never happy with the processing I’d done on it before; so a few minor adjustments were in order. 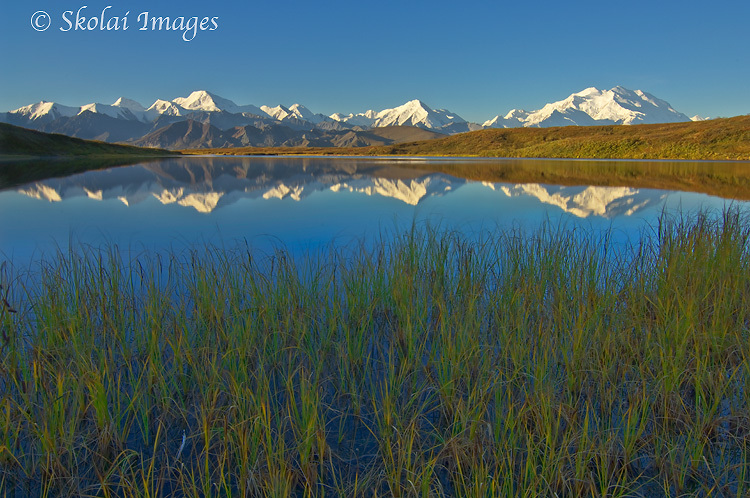 So here it is, my new favorite image (of mine) of Denali, the Mountain, Mt. McKinley (I still cringe when I refer to Denali as Mt. McKinley; (thank you President Obama, for officially renaming the mountain back to its former, and far more apt, “Denali”) yet another thing I hope I never view with nonchalance). I’ll be out in the mountains for a few days, but will reply as I’m able. PS – I’ll be out for a few days, so won’t have any new posts until I get back. Be good. Oh wow, that is one sweet view! Simply awesome picture. Carl, beautiful photograph and wonderful account. We were in Alaska in June 2008 and caught a glimps of Denali but it was very hazy so no good photographs. From that brief experience it’s easy to appreciate the challenge in photograhing this magnificent peak. You have produced a lovely image. Thanks a bunch. Enjoy being out there!